Provinces, SANA – More of the terrorists’ hideouts and vehicles are getting destroyed as the army units targeted their positions and sites in various areas across the country. 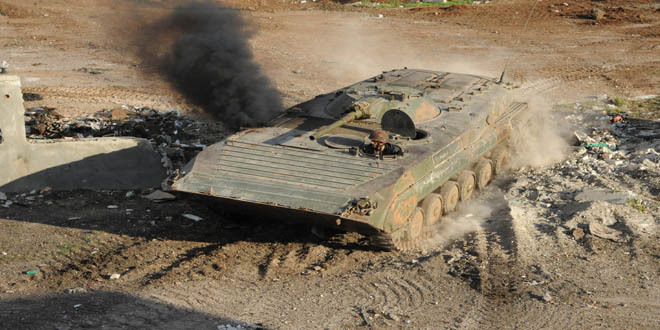 Army units destroyed targeted ISIS positions in the villages of Sharbaa, Rasm al-Kabir and Rasm al-Kama in the eastern countryside of Aleppo province. A military source told SANA that hideouts and vehicles equipped with heavy machine guns were destroyed in the operations. More vehicles for ISIS terrorists were destroyed in al-Bab city, 38 km northeast of Aleppo city, and in the surroundings of al-Nairab Airport, 10 km east of the city. Jabhat al-Nusra-linked terrorists had some of their centers hit and destroyed by the army units in Orum al-Kubra and al-Zirbeh villages in western and southwestern Aleppo. In the northwestern countryside, an army unit directly hit gatherings of terrorists in Hreitan town, leaving many of them dead and destroying their weapons and vehicles. Sites of Jabhat al-Nusra terrorists were targeted in the neighborhoods of al-Lairamoun, Bani Zaid, al-Sakhour, al-Sheikh Khodr and al-Rashidin in Aleppo city. Field sources confirmed the death of at least 22 terrorists from so-called Jaish al-Fatah in the army’s operations against their positions in Idleb and Hama countryside. The Syrian Air Force destroyed ISIS’ positions and dens in al-Hadath, Hawarin and Jabal Mahin al-Kabir in the southeast countryside of Homs. The army’s air force also raided ISIS positions and destroyed their weapons in the surroundings of al-Bayarat to the west of Palmyra. An army unit killed a number of terrorists in al-Gharbi neighborhood in Attman town to the north of Daraa city. Another army unit destroyed a vehicle belonging to Jabhat al-Nusra along with all terrorists inside it to the south of al-Abassyia Cemetery in Daraa al-Balad.